I needed a bit of a break from complicated sewing projects, so I pulled McCalls 7185 out along with some cotton yardage. My initial reason for purchasing this pattern was the straight skirt version with the asymmetrical opening. But I suspect that one will be rather difficult to wear without flashing a lot of leg. So I went with the easy-to-wear full skirt option. This is one of those multi-cup size patterns that everyone always raves about. I chose to go with the C cup, and while that is my bra size, these patterns always end up slightly too large through the bust for me. This time was no different, and so this is probably my last attempt using the FBA drafted by McCalls. But I am still going to call this a success because I really love the dress! It’s so easy to wear, even if it is a bit more roomy than I am used to. The design looks like a contemporary take on a vintage house dress to me, and makes me want to find an original Swirl Wrap Dress pattern to try. Or I may have to make another version of this dress. But for now, this is definitely going to be a great garment to have on hand in the summer heat. Hooray for cotton! Shoes: Miss L Fire "Casablanca"
I love your dress, especially the wrap bodice. I use the mcalls multiple cup patterns (too lazy to do full bust adjustments but I'm interested in you saying they are too big, I have too do quite a but of adjusting. Having said that I'm still going to buy this pattern! My upper torso is rather narrow and straight up and down. I think these patterns tend to be drafted for a body shaped like two inverted triangles (basic hourglass) - I have the bottom half of this (narrow waist, wide hips), but my rib cage does not widen out from waist to bust. Side seams at the underarms sometimes pooch out, although now that I am a bit bigger in the bust, this happens less often. I am guessing that is where some of the needed ease for my bust is coming from. I am sure experts in alterations would be making "proper" changes, but 9 times out of 10, the given pattern works fine for me. I am not sure they use actual fit models any more (probably just computer software, etc.) but it would be interesting to see a 3-D figure of the body they are drafting for! I am one of those people who doesn't want the McCall and Simplicity sizing to change - at least they are consistent, and I know what I will need to alter! I love that bodice and what a fabric!! I adore how 40s it ends up looking when the pattern image looks rather meh! This shows how good of a seamstress you are - seeing potentials in boring patterns! Absolutely lovely dress and choice of heels to partner with it. That's very pretty, and nice to see that pattern made up. Cotton is a good choice for 40s-style dresses, since wartime rationing made it a popular fabric for dresses back then. You wear this so well! I always look forward to your projects. I adore this dress! It is a beauty on you. Where did you find the fab fabric? I, too really enjoy your blog posts. The fabric is a quilting cotton from JoAnn Fabrics. The selvedge says "DS Quilts Collection for Fabric Traditions." This is the perfect wrap dress. Perfect! The dress is beautiful! Oh and I love your shoes. My understanding of pattern cup sizing is that it's the difference between your full bust and the upper bust, while bra cup sizing is about the difference between your full bust and underbust/ribcage. My pattern cup size is a C while my bra cup is DDD! I agree that I prefer the sizing to stay the same; I know my alterations and wouldn't want to have to relearn them. I've got a Swirl dress pattern. 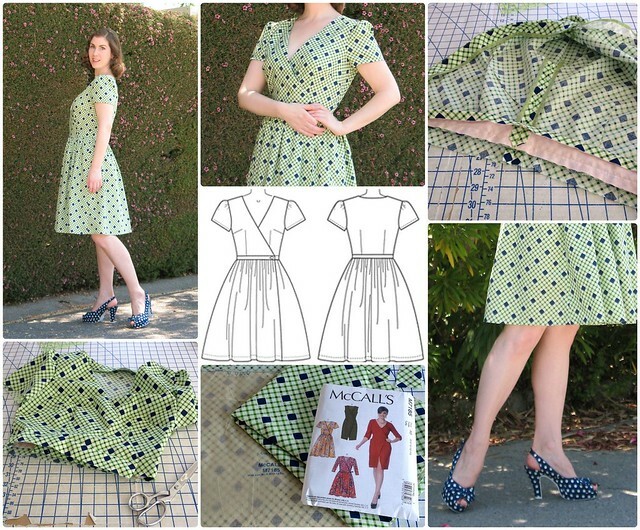 Ilk copy it and bring it to you when I see you next, and return your dress pattern to you! Hi. Love your dress. I think it is interesting that McCalls are reading your blog, urging you to support their brand through social media but fail to answer the very reasonable questions you pose about their product.